which do not bite people but can the the source of an irritation that can appear “bite like”. The solution can be as simple as removing shoes and socks until you are able to remove the hairs which are the source of the irritation. Please see the key facts below and the linked document which explains the issue in more detail.This problem should not be treated in a chemical fashion as the source of the irritation is already dead. The hairs of carpet beetles can cause irritation. It is not possible to diagnose the cause of a skin reaction, bite or otherwise. Most homes have a small number of carpet beetles but most people are unaffected by them. The issue can appear to start with the onset of winter as central heating is first turned on. The solution is about removing the source of the irritation from the environment not trying to kill anything. Carpet beetles do not leave faecal traces like bedbugs. 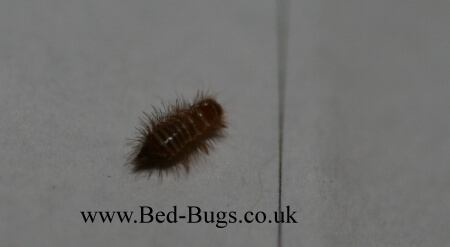 Click above to access our free PDF on Carpet Beetles which includes a simple and effective solution.